The first Thrillema last night was a huge success. The Empire 6 Theatre in Dartmouth (not the Dartmouth Crossing – which I almost went to) was packed with movie fans. When I arrived, I signed human guestbook and met Adam Perry of The Last Game Store who helped coordinate the event. 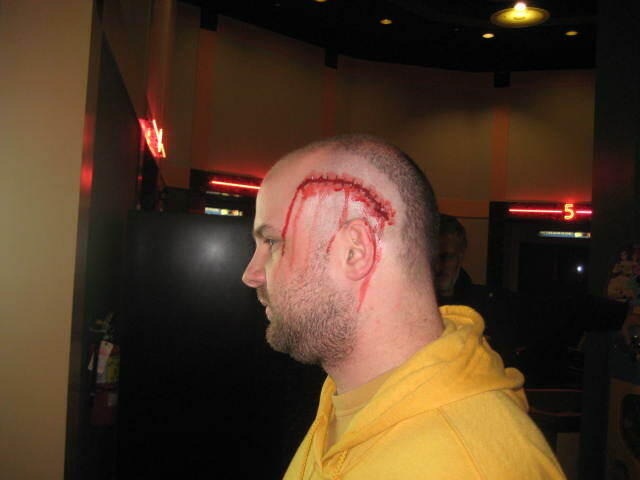 He had a huge gash on his head for the occasion. 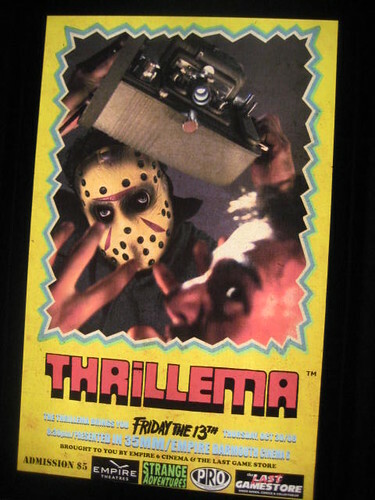 He explained that they have plans to bring more 35mm horror movie prints, but could not confirm what would be showing at the next Thrillema on November 13. They didn’t know they were getting Friday the 13th until last Tuesday, and so it was a nice surprise that so many people showed up on such short notice. Adam tried to blame Barack Obama for it. Dartmouth auteur, Jason Eisener, was super happy with the turn out and was listing off some of his favourite movies that they are trying to bring. Expect a bit of John Carpenter and maybe some Fred Savage at future events. 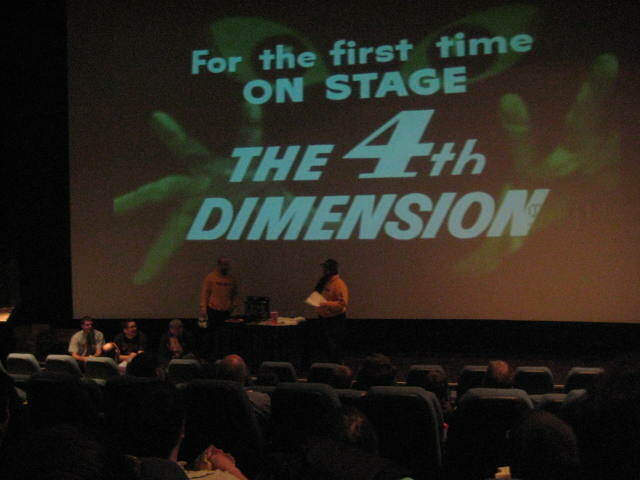 Eisener gave out prizes to anyone who knew that the film’s score intentionally resmbled “kill kill kill , ma ma ma” or that the famous sleeping bag murders took place in “Jason VII” and “Jason X”. After all the prizes were given out, we were treated to some vintage horror movie trailers from the 70’s and a PSA about the monstrous “Pay TV” industry. When the crackly 35mm print for Friday the 13th finally started, the packed theater cheered for all the murders, laughed at the uncomfortably long takes of characters doing mundane things, and were ocassionally startled by people in Jason masks walking toward the bathroom. It was an awesome time, and the film was a great choice to kick off what promises to be an exciting monthly movie night.